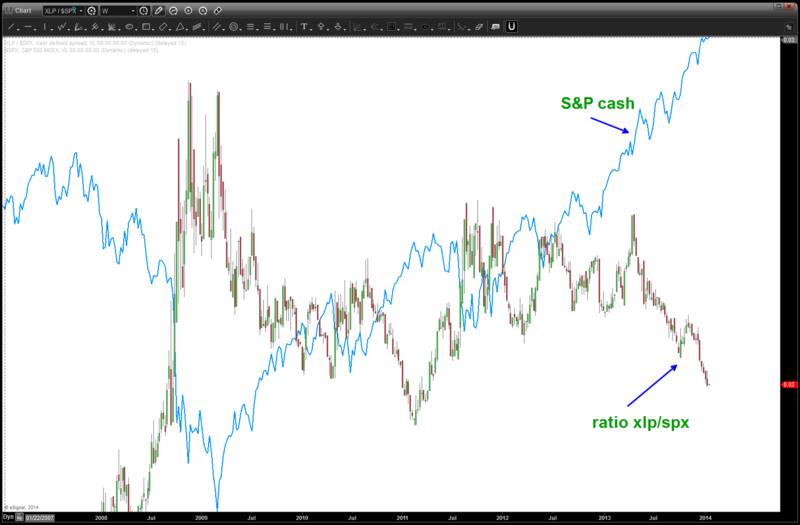 the week of October 07, 2013 we have an AMAZING BUY of the ratio that was precise in both PRICE and TIME. It hit, the market sold off but it was subsequently taken out and the PATTERN FAILED. End result: BULLISH for the stock market. it was also noted, that the .02 level was a potential target. at the beginning of the new year this target was hit and, while it held intraday it has been subsequently been defeated. In my mind, I try to stay away from intraday spike highs or spike lows …however, if we get a weekly close below a pattern level THEN, probability says it’s a failed pattern. 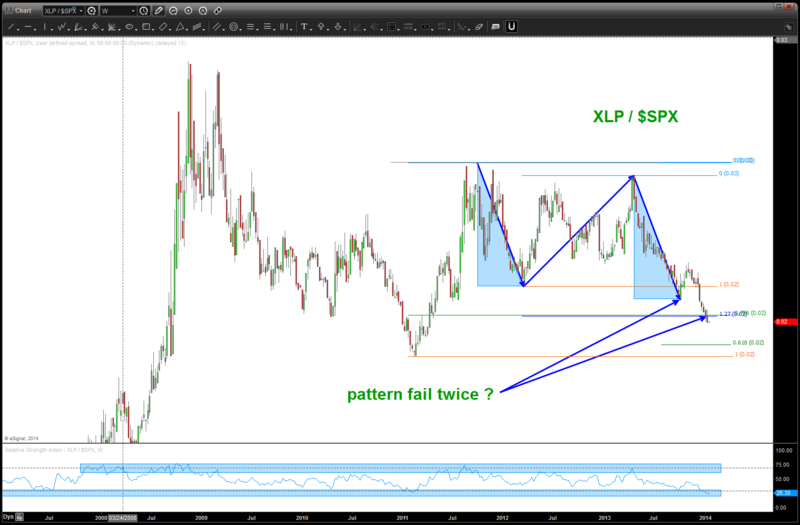 Take a look at the below chart … we have a weekly close below. End result: BULLISH for the stock market. so … while we aren’t too far below the level depicted (1.27 and .786 overlap – usually strong support) I can tell you we need to get back up above and close above on a daily basis that level OR this S&P move could continue. also, I put my trust weekly 14 period RSI in to check out the “zones” for it’s support or resistance … I went back as far as my data would allow and I can tell you that 1) we have bullish divergence on the DAILY chart and on the weekly this is the lowest the RSI has ever been. 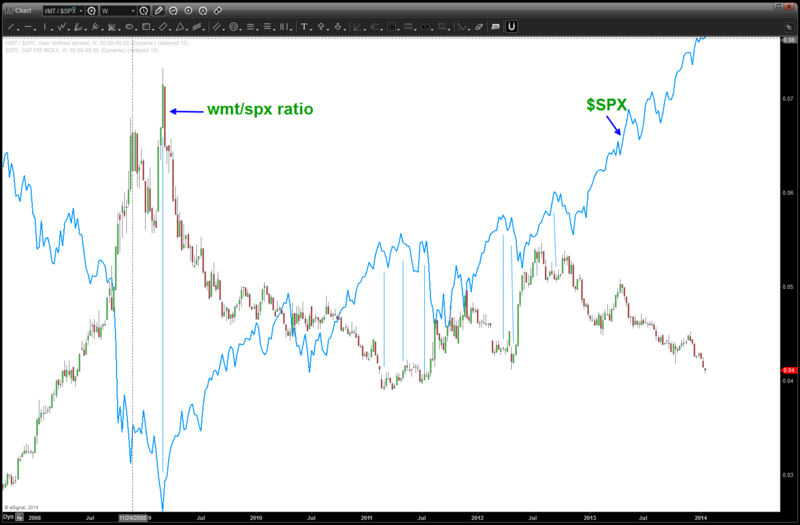 note, do we have two patterns failing on the important XLP/SPX ratio? 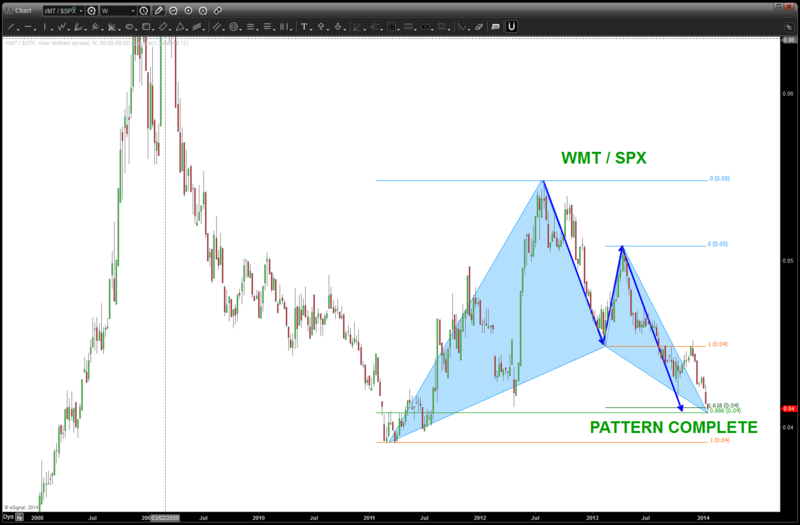 PUNCH LINE: these patterns are complete. for the bears to have a chance, they SHOULD NOT fail …..